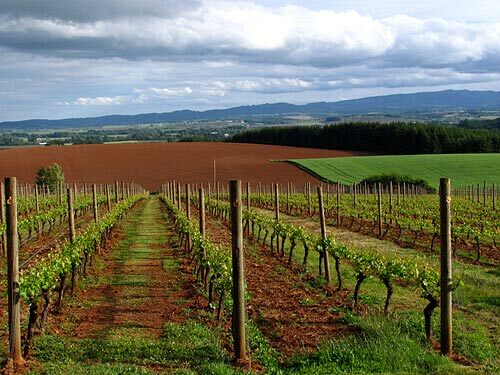 (Newberg, Oregon) - A nip in the fresh country air, a cozy fire in your deluxe room, massages for two, a disarmingly divine meal paired with world class pinot noir. If that’s not a recipe for romance, what is? In that spirit, the Allison Inn & Spa, a resort in Oregon wine country that is located on 35 hillside acres, has created a Valentine’s package to make anyone swoon. The gush-inducing package starts at $430 and includes a luxurious bedroom with king bed, fireplace and soaking tub. Complimentary chilled champagne upon arrival starts the celebration, followed by a delicious, customized four-course dinner in the acclaimed JORY Restaurant featuring Oregon Wine Country Cuisine ensures a meal to be remembered. Special menu available on Sunday and Monday evenings only. On Friday and Saturday, guests may order from the a la carte menu and receive a $150 credit towards food and beverage. First course: Choice of Roasted Apple Crepes with pancetta, arugula salad & comté cheese OR Champagne-Lime Scallop Ceviche with oysters, piquillo peppers, cilantro coulis & white corn tortilla chips. Second course: Choice of Coconut-Curry Mussels with Oregon mushrooms, peanuts, cilantro & grilled roti OR Sunchoke-Saffron Soup with pearl onions, hazelnut gnocchi & goat cheese crème fraîche OR Garden Chicory Salad with candied walnuts, Rogue River blue cheese, honey crisp apples & red onions. Third Course: Choice of Parsnip Ravioli with black périgord truffle, fried quail egg & caramelized fennel OR Roasted Duck Breast with broccolini tempura, cara cara oranges, almonds & bitter orange coulis OR Pan-Seared Halibut with endive ravigote, spaetlze, maitake & dijon-molasses sauce OR Pepper-Crusted Wagyu New York Striploin with potato confit, cream-braised cavolo nero, cippolini onion & smoked port sauce. Dessert: Choice of Peppermint Pots de Crème with “red hot” candy & pistachio nougatine OR Medjool Date Beignets with passion fruit Chantilly & white chocolate ganache OR a selection of chocolates for two. Valentine’s menu is $75 per person for food plus $45 per person for optional wine-pairings (wine not included in customized special menu). JORY boasts 700 varieties of wine in its wine cellar to accompany your gourmet meal on Sunday and Monday evenings. They also offer 50 wines-by-the-glass in JORY Bar. The Valentines & Vineyards one-night lodging package is available Friday through Monday evenings, February 11-14. Take advantage of The Allison Spa and book your spa treatments well in advance. An indoor swimming pool and fitness studio is complimentary and for the exclusive use of resort guests. The nearly 15,000-square-foot spa, also features 12 treatment rooms, three lounges, landscaped garden terraces and fire pits, organic spa products complemented by ingredients grown in the garden, Jacuzzi, saunas, steam rooms and a retail boutique. Package rates start at $430 based on double occupancy. Taxes and gratuities not included. Valet and overnight complimentary parking. Friday and Saturday evenings, there are live Jazz performances in the Living Room, adjacent to JORY Bar from 6:30 – 10:00 pm. A lovely way to start your celebration or end with a night cap. For information or reservations, phone toll-free 1-877-294-2525 or 503-554-2525. www.theallison.com as well as on Facebook and Twitter. For JORY reservations, call (503) 554-2526. The Allison Spa: (503) 554-2524.